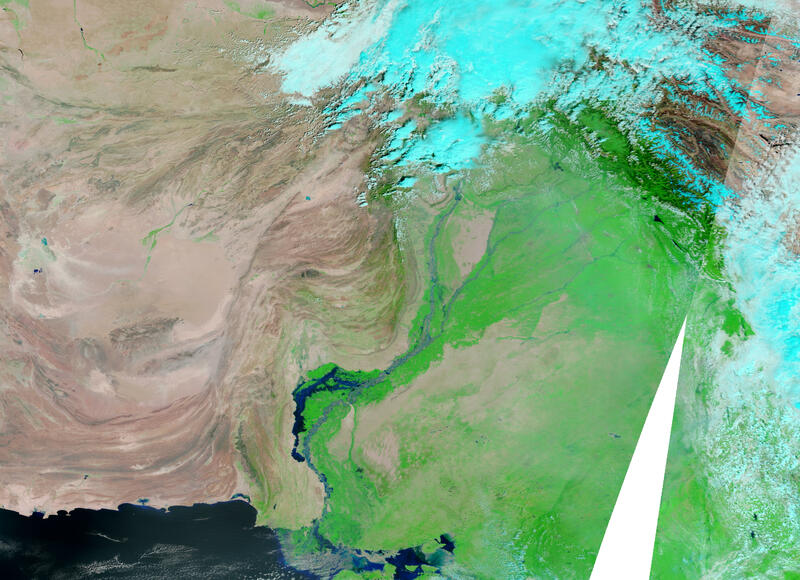 Flood waters were slowly receding in Pakistan in mid-December 2010, almost five months after the monsoon rains that devastated the country first began falling. Visiting the country in early December, Valerie Amos, United Nations Under-Secretary-General for Humanitarian Affairs, described the flood disaster as “far from over,” and discussed Pakistanis who had lost their homes and livelihoods. 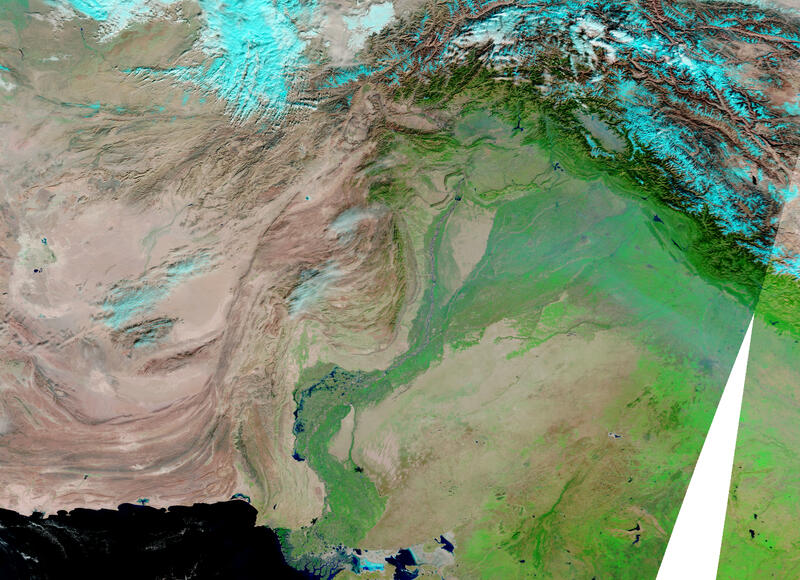 Acquired by the Moderate Resolution Imaging Spectroradiometer (MODIS) on NASA’s Terra satellite, these images show southern Pakistan before and after the 2010 monsoon rains. The top image is from December 15, 2010. 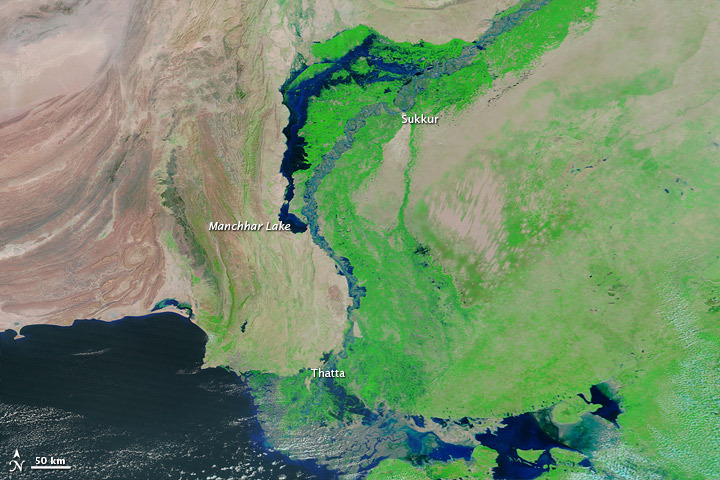 The middle image shows the area when flood waters in southern Pakistan were around their peak, on September 17, 2010. 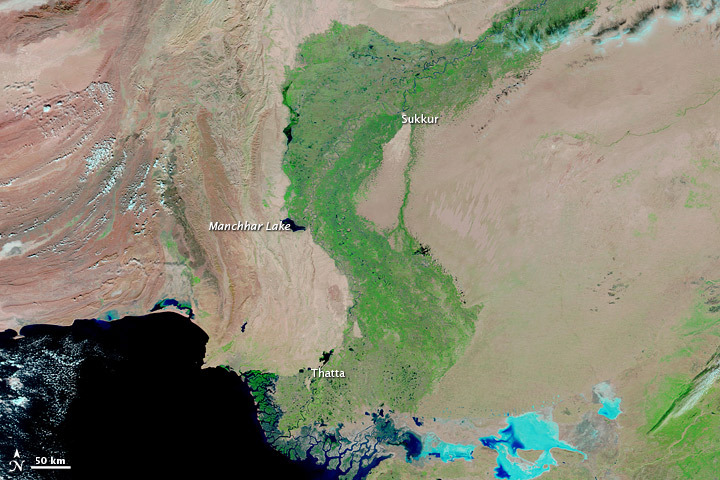 The bottom image shows the area on December 16, 2010, following a more typical monsoon season. All three images use a combination of infrared and visible light to increase the contrast between water and land. Water ranges in color from light blue to navy. The moist, marshy areas along the coast reveal some of the lightest shades of blue. Vegetation, even sparse vegetation, appears bright green. Bare land ranges from pink-tinged beige to brick. Pale blue-green clouds cast dark shadows onto the land surface below. Around the city of Sukkur lies an irrigation network supporting agriculture in Pakistan’s Sindh Province. 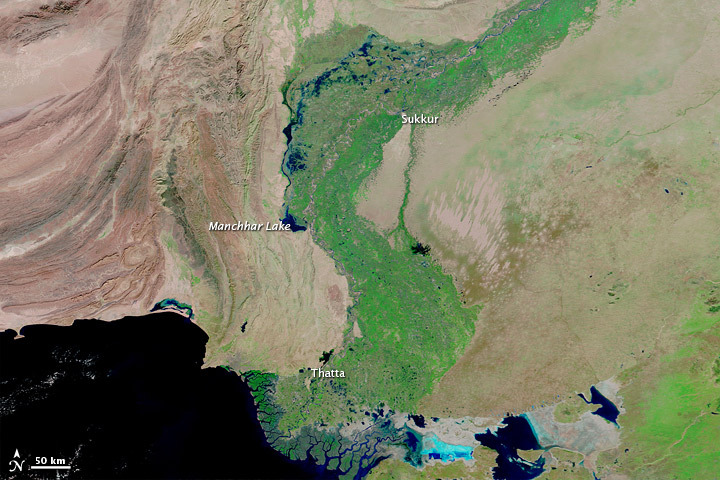 During the 2010 monsoon season, floodwaters overwhelmed a dam north of Sukkur, creating a vast flood lake that terminated in the preexisting Manchhar (or Manchar) Lake. With no easy outlet, the flood waters sat on some of Sindh’s best agricultural land for months. 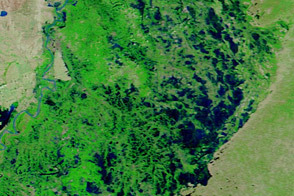 Compared to the image acquired two months earlier, the image from mid-December 2010 shows a substantial reduction in this floodwater lake. Compared to the image acquired a year earlier, however, the December 2010 image shows the extent of the lingering floods. Lasting flood damage is also apparent along the coast, around the city of Thatta. Although the image from December 2010 shows remarkable improvement over conditions two months earlier, it also reveals persistent pockets of floodwater that did not exist the previous year. 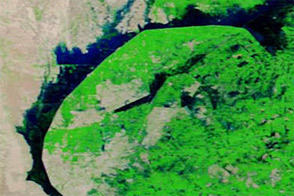 NASA images courtesy MODIS Rapid Response Team at NASA GSFC. Caption by Michon Scott. 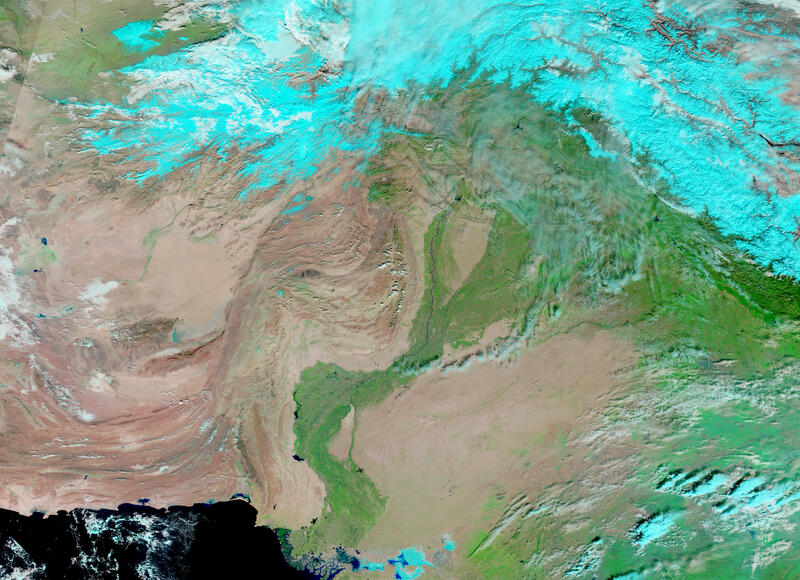 Acquired on December 15, 2010, September 17, 2010, and December 16, 2009, these false-color images show southern Pakistan before and after the destructive 2010 monsoon season. United Nations Office for the Coordination of Humanitarian Affairs. (2010, December 3). Pakistan: Emergency far from over in the south and suffereing must be stopped. ReliefWeb. Accessed December 16, 2010.